(Photo credit: Idris Erba) By Scott Gilfoid: If former IBF/WBA/WBC super middleweight champion Carl Froch was hoping that he would be remembered by boxing fans for a long time after he’s retired gone away from the sport, he needs to talk with #1 WBC George Groves (21-2, 16 KOs), because he believe that Froch will be forgotten very soon by fans now that he’s stepped away from the sport to exist in retirement. Groves says he doesn’t like Froch, who beat him twice by knockout. Groves says that at the end of Froch’s career, he was trying to handpick opponents to fight and wound up being stripped of his WBA title and had to vacate his IBF title. Yeah, I agree with Groves. I think Froch will pretty much be forgotten. It’s kind of how the sport is. When you’re out of sight, you’re out of mind of the average fans. The only ones that tend to think about fighters long after they’re gone are the ones that are huge fans of that particular fighter. Let’s be real about this; the only way a fighter can be remembered for a long, long time is for them to do something really special. Unfortunately, I don’t think Froch’s career was what you would call a really special one. Yeah, he made a ton of money for his last three fights of his career against Groves and Mikkel Kessler, but as far as big wins go, Froch really didn’t put together a lot of huge wins. He has a controversial win over Andre Dirrell that a lot of people thought Froch lost. Then there’s Froch’s defeat at the hands of Andre Ward, and the fact that Froch opted not to fight Ward to try and avenge the loss. Froch lost to Kessler when he was starting his slide. It wasn’t until Kessler was clearly over-the-hill that Froch finally beat him. If Froch keeps his Sky analyst gig for a long time, I think he’ll be mostly remembered by fans for him doing that rather than for fighting. It’s kind of like that with ex-athletes. The ones that remember them are the fans that were around when they were competing. But the younger fans won’t have clue one who Froch is and will know him basically for what he does as an analyst. I’m not sure how long Froch will keep his job with Sky though. That’ll be up to them. Froch does seem kind of stiff and unnatural behind the microphone. He’s going to need to loosen up a lot and be a little less guarded with his thoughts. Froch needs to relax more and try and be more smiley behind the camera. When I watch him, he puts me on edge because he’s so stiff and unnatural. I can understand why Groves might want Froch’s name to be forgotten, given that he was knocked out twice by him in the past. It’s something that I’m sure Groves would rather people not remember. 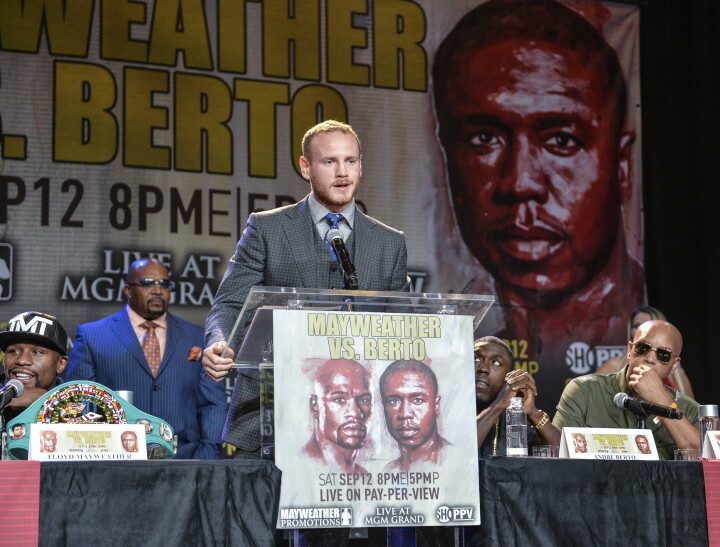 Groves will be trying to resurrect his imploded career next month when he challenges for the title against WBC super middleweight champion Badou Jack (19-1-1, 12 KOs) on the undercard of the Floyd Mayweather Jr. vs. Andre Berto fight on Showtime pay-per-view at the MGM Grand in Las Vegas, Nevada. It’s unclear if the Jack-Groves fight will make it on the pay-per-view portion of the fight in the United States or not. There are two other important fights involving big name starts that could take the television spots and possibly leave the Jack vs. Groves fight off the TV. WBO super featherweight champion Roman Martinez will be defending his title in a rematch against Orlando Salido. There’s also Ishe Smith facing Vanes Martirosyan. Mayweather Promotions CEO Leonard Ellerbe is talking about another fight being added to the card. If that’s a good one, then I wouldn’t be surprised if we see the Jack-Groves fight moved to the off TV part. I mean, I’d like to see the Jack vs. Groves fight, so I hope it doesn’t get shoved off the televised portion of the card. I hate to say it but I think Groves is going to get whipped by Jack on September 12th. I just believe Jack is going to break Groves down, pound him royally, and then knock him out in that order. I hope for Groves’ sake that he has a good backup plan to which direction he wants to take his career in afterwards. I would suggest that he try and go after IBF champion James DeGale if he can get a fight against him somehow. I mean, I’m not sure how Groves would get a title shot off the back of a knockout loss to Badou Jack, but then again I was completely taken off guard when the World Boxing Council picked Groves out to fight in their WBC eliminator against Christopher Rebrasse in 2014 following Groves’ back to back knockout losses to Froch. If the WBC was cool with letting Groves fight in their eliminator off of two knockout losses, I guess the IBF might thinks it’s a marvelous ideal to let Groves fight for their world title against DeGale off of a knockout loss. It wouldn’t make much sense to me, but I could see it happening.